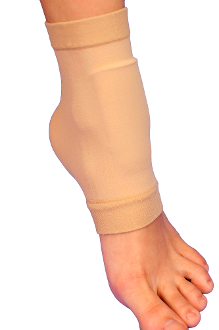 The Bunga Pads Gel Lace Bite Sleeve has a rectangular medical grade gel pad attached to a thin, elastic sleeve which reduces pressure, shock and vibration from the shin to the top of the foot. Hypo-allergenic. Can be worn with shoes, athletic footwear, ski boots, skates, and cleats. This product is washable and reusable and is available in two sizes.